The recent PwC Land Operations and Land Administration benchmarking study uncovers the often overlooked and difficult-to-quantify role that basin complexity plays in appropriate land department staffing. As exploration and production companies (E&Ps) continue to deal with sustained low commodity prices, many land department heads are asking whether or not their organizations—including both land operations and land administration—are right-sized. This question is driven by four factors: 1) continued pressure from the top to reduce costs; 2) the sense that workloads are rising across the workforce; 3) changes in company focus and areas of operation; and 4) changes in outlooks for the future. There are many challenges to answering the right-sizing question. Uncovered in the recent PwC Land Operations and Land Administration benchmarking study is the often overlooked and difficult-to-quantify role that basin complexity plays in appropriate land department staffing. We outline that impact in this article. Recent evidence from 18 E&Ps participating in the PwC study (representing nearly 45 million aggregate net U.S. onshore acres) indicates that geography may matter more than many land professionals previously thought, especially in Texas. Companies with a Texas footprint, specifically the Permian Basin and Eagle Ford Shale, have as much as 3-4 times the land headcount as compared to other basins for a given level of activity (in terms of leases, acreage and active agreements/contracts). 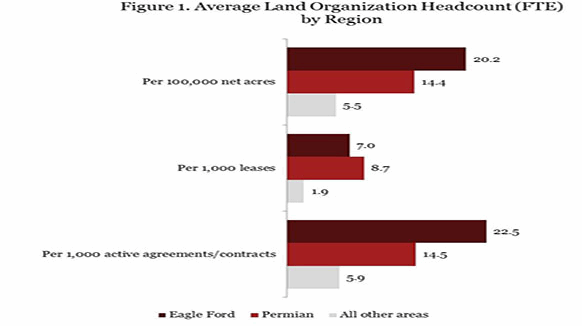 Figure 1 displays average total land organization headcount (FTE) for Eagle Ford and Permian areas of operation on the basis of those areas’ total acreage, leases and active agreements/contracts. Put on these common bases, land headcount in the Eagle Ford is 3-4 times that of other areas, and that headcount in the Permian is generally 2-3 times that of other areas. The importance of this finding is twofold. First, as mentioned above, it reinforces the intuition of land professionals that factors specific to certain geographies (notably a lack of forced pooling, above-average lease complexity, longer lateral lengths associated with unconventional plays, mineral owner sophistication, etc.) can be important drivers of the amount of time it takes to lease an area, assemble a unit and drill a well – ultimately driving up land department headcount. Second, and more importantly, the result suggests E&Ps should weigh operational complexities prior to making headcount decisions and in parallel with strategic portfolio changes. The relationship observed in Figure 1 does not appear to be the result of high levels of activity in the Texas basins. Indeed, operators whose areas included the Eagle Ford or Permian as well as other basins had much higher land headcount (per acre, lease or agreement) assigned to the Texas basins even if a larger portion of their CAPEX and wells drilled—rough measures of land activity—were outside Texas. In addition to complexity, participants of the PwC Land Benchmarking study identified several other factors driving land department headcount (See Figure 2). 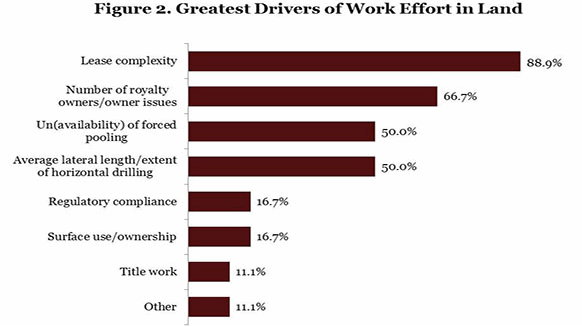 While virtually everyone identified lease complexity as a driver, approximately two-thirds of participants mentioned royalty owners (and their issues) as a key driver. Finally, half of the participants identified the availability or unavailability of forced pooling and average lateral lengths as primary drivers of land headcount. It is also worth noting that large majorities of study participants operating in the Eagle Ford and Permian agreed that their leases in those areas were virtually all “non-standard,” i.e., those containing provisions requiring a significant amount of scrutiny and manual effort during all phases of operations. Looking forward, there are three key concepts that executives (land and non-land alike) need to keep front of mind as they begin to plan for the future and make strategic headcount decisions. First, it is important to recognize that the complexities and constraints faced by land organizations—and the need for close communication and coordination between land and finance, legal, operations and other functions—are often not well understood by non-land professionals. Articulating those complexities, as well as the strategic value land can bring to the organization, is particularly essential for land during the “lower for longer” environment in which the industry currently operates. One way to begin communicating that value is through a formalized framework or model. 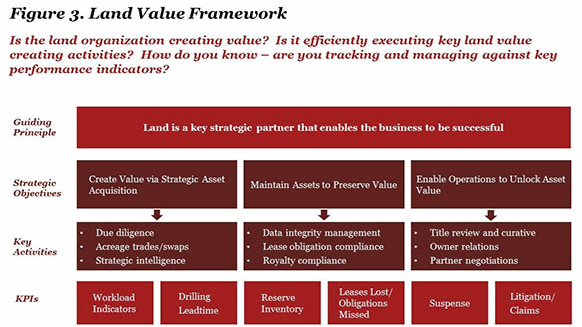 PwC has developed a simple framework that can serve as a model for land organizations seeking to formalize the value they bring to the company. The framework outlines key guiding principles, strategic objectives, foundational activities and key performance indicators (KPIs) that land organizations can track (see Figure 3). Second, many of the complexities and activities that drive headcount continued unabated during the slowdown in drilling activity and its accompanying reduction of capital spending. Those include the volume of royalty owner inquiries, lease complexity and the increasing average lateral lengths found in resource plays. Because of those factors, land executives are keen to address the right-sizing question in a way that takes into account the complexity of their operating environments and not simply as a linear exercise in relation to capital spend.